In late December 2013, we promised an interview with the Oh Beep! Geocaching Podcast, and here it is! This Podcast, originating from The UK, made it’s debut on November 9th, 2013. The latest episode on their website as of the date of this post is episode 12. And Ohbeep.com is a very well done website, there you will find links to follow the show on several social media outlets, as well as links for the many options to subscribe to the podcast. On with the interview! OCNA BLOG: As we almost always start out, where are you from and how did you first hear about Geocaching? Who are the cast of characters behind the show? Benignsource: My name is Mark, aka Benignsource (on GC.com we’re known as [Team D]Benignsource. We’re from Nottingham, in the UK. A friend told me about Geocaching, I signed up on GC.com and looked around but couldn’t fathom it, so I didn’t really do anything until a year later (2012). In June 2012, I was looking for some way to occupy the kids – all four were in my flat and were bored, we needed to get out. So, I got the app for my phone and out we went. At the time I knew nothing about Geocaching and the different cache types. The closest cache to us was at the nearest school, we spent a good while searching but couldn’t understand why we were being led to the middle of a playing field. As it turns out, we only discovered this much later, it was a puzzle cache so we were on to a loser before we started. That was our first DNF. I was determined we were going to have fun (well, more like I was determined not to spend any more time locked up at home with four bored children. With a new cache located on the phone, off we went again. The second one had us playing follow the bouncing arrow. We spent ages looking. Eventually, I discovered the hint button on the app and soon after the cache was found. It was a little film pot, but for us it could have been a pot of gold. The third cache was easy, CacheZilla walked right up to it and picked it out of a tree. What made the day for the kids was one of the caches being located at a footpath at the back of a pub beer garden. What made this special to them? The pub had a trampoline in the garden. Safe to say, when we got home that night, they were worn out. For me the best part was being taken to a rail track that used to be used by the local mine – it was one of those situations where I’d lived in the place all my life and had never seen this rail line. Thats how we got started. Since then we’ve found 417 caches. On the show the regular hosts are Cachezilla (11), Doctor D (13) and myself (39). Now and again Ben Button also chips in, he’s 9. When we’re out caching Miss Watto (my partner) joins us. If we’re really blessed my 16 year old son also joins us when out caching. OCNA BLOG: Interesting name, Oh Beep! As in Oh, expletive? Benignsource: That’s exactly it. Long story short, we’d gone out to do our first series of Geocaches and we’d gone ill prepared. It was a very hot day, everywhere seemed to be overgrown (making wading through hard work) and we’d got to a point where there was a bit of muddy ground. I had my head down, making sure I didn’t slip, when my partner said my name. I was a bit dismissive – didn’t want to end up on my backside – but she persisted. Eventually I looked up and saw a massive hill. Without thinking, I said “Oh s**t!”. Sophie, our daughter, quickly said to her mum “Mark said Oh Beep!” Replacing the expletive with Beep. Not my proudest parenting moment, but from that day on whenever I did something stupid (usually falling over) when out Caching it became known as an Oh Beep! moment. When we were looking for a name for the podcast, all the names i suggested were rubbish. Then the kids said why not call it The Oh Beep! Geocaching Podcast. To them it means a funny moment, so I thought why not. OCNA BLOG: The Podcast sounds very good from a technical standpoint. Are we to understand you had no prior Podcasting experience with topics other than Geocaching? We also understand DarrylW4 from Geogearheads and The Geocaching Podcast has been mentoring you? Benignsource: Thanks, the sound is something I keep pushing to make better. If you’ve heard the first four or five, it was all of us around one mic and it sounds awful. In fact, for episodes 2 and 3 I’d forgotten to turn the mic on so they’re both recordings done straight in to the computer. I had zero experience in podcasting. Darryl and The Bad Cop are responsible for us starting our podcast. They’d done a Geogearheads show on podcasting at around the time I was thinking we could do a podcast. Their show was the final convincer. I promptly went out and made every mistake imaginable. Darryl has been a great help in putting me right on so many things, I can’t thank him enough for all he’s done. OCNA BLOG: Unlike The Geocaching Podcast and The HikerJamz show, it doesn’t appear one can listen to The Oh Beep! Geocaching Podcast live? Do you try to get the shows up on the internet at a specific time and day of the week? Benignsource: We pre-record, for the sanity of the listeners and myself. Keeping the kids on topic is akin to herding cats. So, there is a lot of post production. We try to aim to have the podcast out on a Sunday afternoon/evening. OCNA BLOG: You’ve certainly submitted your Podcast to several directories out there. The Blogger was even able to subscribe via Windows Phone! Which of these do you personally prefer? Do they all give you statistics on how many subscribers you have, and how many downloads there were? Benignsource: The thing I didn’t want is for people not to be able to get hold of the show, just because they didn’t happen to have this phone or that mp3 player. So, when I came across a directory I submitted the podcast. Hikerjamz has been great with this too. If he see’s a place accepting podcasts, he’ll drop me a message and likewise if I see somewhere I’ll let him know. Hikerjamz is someone else I can’t thank enough. From having us on his show, to making me aware of places to put the podcast. I consume podcasts mainly on my iPod, so I generally go with iTunes. I don’t really have a preference, as long as you can get it. Took a while to find out who to contact about getting on to Windows though, so its pleasing to see it payed off. Download stats come from Libsyn, who gather the stats from wherever we submitted the feed. OCNA BLOG: What are some of the reasons you started the show? Were you thinking local or International audience in the beginning? Benignsource: Beyond the events section, we don’t really plan our shows based on our location. Two thoughts formed the idea for the show. The first was for the kids to have fun and learn new skills. The second was that there were too many middle aged men representing Geocaching in the podcast arena. Location didn’t really come in to it. Sandy (Podcacher), Tracey (The Podcast Show), Lady Z (TCGCPC) and now The HeadHardHattress (GeoSnippets) all provide a breath of fresh air to the Geocaching podcast sphere. I would love to hear them on a roundtable show, with CacheZilla. Thanks to Mark for a great interview, we really appreciate it! So give the show a listen, we think you’ll like it. 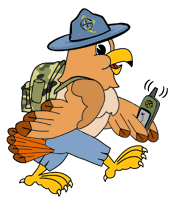 You can subscribe in a variety of ways for your phone or audio player, but the blogger personally likes going to the website, as the show notes for each episode are very well done, and even include the Geocaching video of the week featured on the show. There is also a blog, which contains news about the Podcast, and lots of content not necessarily included in the podcast. And it’s very easy to remember; you probably won’t even need to bookmark it. ohbeep.com! OCNA Blog note: Sorry, we thought we posted this, but discovered it was only a “draft”. We’re back dating it by a couple of days. :-). The Doc makes a HOMEMADE GEOCACHING REACH POLE! Follow his instructions and you can too! (The GCDoc Video) GEOCACHING CONTEST RESULTS! The WINNERS of The Doc’s EPIC GEOCACHING CONTEST! OCNA Blog Note: This weeks show, which is episode No. 42 of the HikerJamz Geocaching Talk show, features an email interview with Mark Holden, a Geocacher from The UK who fabricates interesting cache containers. Watch The Doc’s TOP 5 FAVORITE GEOCACHING VIDEOS of 2013!